A period to regaining strength, some training sessions and doctor visits if needed. The famous Allan Allsop - who has also visited the underground caves of Naours village, a popular tourist site at 5 mi from Vignacourt - cited in his diary, several visits to the surgeon and the dentist to Vignacourt, all the day. He speaks also of concert in Vignacourt. These concerts was quite common in the region, for instance to Amiens city also : the aim was to recover funds for the wounded soldiers, the most of the time. 7th Machine Gun Company, 4th battery, 1st Div - Flers and Vignacourt, from 1st to 18th December 1916. 19th Battalion NSW - 1918. A few soldiers were photographed by Louis Thuillier (N° PO10550.093). Others cities "crossed": Amiens Mont-St Quentin. 52nd Battalion - this Battalion was photographed by Louis Thuillier with the monkey, the Battalion mascot. 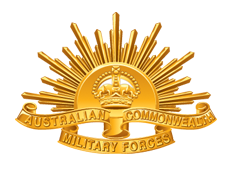 The rising sun of the ANZAC Australian and New Zealand Army Corps. The template of the badge used during the First World War below, has been manufacturer in other versions for special ceremonies (modification of the roller inscription for example) and it has evolved over time. Canadian Army Medical Corps - CAMC - Vignacourt and Crouy - summer 1918. Canadian Railway Troop - CRT (12th) - Vignacourt, Etricourt 1918. 41th RI : A few hours. Squadron train 13th: Their goal was to supply the trains (21st Cie, Captain Chalard) From April 13 to May 3, 1918, they moved to Saint-Germer (Oise) Fresnoy-au-Val, Vignacourt, Candas during this period. Then Châlons-sur-Marne (The harvest and transport of food for the civilian population in the Marne). It was a convoy by road with horses for some companies. Gordon Highlanders (2nd) - Ailly sur Somme, Vignacourt (train), Mericourt. 17th and 19th Kings Liverpool regiments. (18th billeting at Fremont and the 20th at Vaux - both villages nearest Vignacourt - side railroad). Manchester Regiment - 17th Bn - Nov 1915 - One night. Located before at Domqueur and after Vignacourt, at Bertangles. Royal Warwicks 14h Battalion - Vignacourt, Pont-Noyelles - End 1915 (3 days). Royal Warwicks 15th Battalion - Vignacourt, Coisy - End 1915 (a few days). South Staffordshire 1st and 2nd Battalions. 33 rd Division AEF	American Expeditionary Force - Eaucourt, Long, l'Etoile, Flixecourt road, Vignacourt, Saint-Vast, Poulainville, Allonville - 1918.